Here's a full list of all our water wise plants. You can also view an image gallery, or view the plants by categories. Achillea 'Moonshine' is a reliable mid-summer bloomer. It is a very strong yellow, so it will stand out in your garden. These plants require very little maintenance. We regularly deadhead the spent flowers to keep a fresh look. Vigorous clumps can be divided in the winter and given away to friends. These plants are magnets for butterflies and beneficials insects. The flowers have lots of nectar and the flat shape of the flower serves as a perfect landing pad for butterflies. 'Taygetea' Greek yarrow is a cheerful, reliable summer bloomer. The flowers start out bright yellow in midsummer and fade to a more mellow shade over time. We also like the grey-green foliage that blends in well with many plants found in low water gardens. 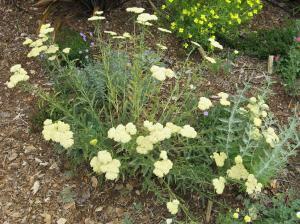 This cultivar of yarrow seems to be more drought tolerant than the popular Achillea millifolium. 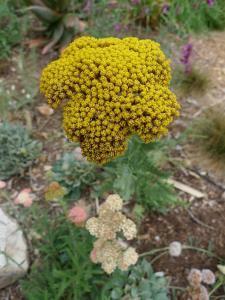 Greek yarrow doesn't need a great deal of maintenance. To encourage reblooming, you can deadhead it regularly. Also, this plant will spread, so don't plant it too tightly. 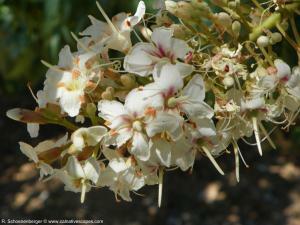 The California buckeye is a unusual native because it is summer deciduous. It will naturally drop its leaves with the heat of summer, but with regular watering it may hold its leaves longer. The California buckeye nectar/pollen is poisonous to European honeybees, but not to native bees. The flower has a candy or perfume like scent, and blooms in very early spring. The tree produces a large nut that resembles a buck's eye, thus the name. The nut is poisonous to eat. The nuts easily reseed where they fall, so collect them if you don't want a lot of sprouts coming up. Without summer leaves, the pale bark of the California buckeye offers interest and structure in the garden. This shrub is very easy to prune and shape for your desired size. Although we are very fond of buckeyes, this plant is no longer in the Demonstration Garden. We decided to remove it because it is poisonous to honeybees. We've had mixed success with Agastaches in our garden. These plants are originally from the Southwest and Mexico, a climate that is somewhat different from our Mediterranean summer-dry climate. According to our references, these plants require well draining soil, but our soils tend to be slow draining clay soils. Even so, we've have had success with this unnamed cultivar. As you can see from the photo, this plant is quite the show-stopper in our perennial beds. Agave makes a powerful statement when placed among grasses and softer, small-leaved perennials. We think Agave helps keep our beds from becoming boring and predictable. Small plants form around the base of the plant, but they are easily pruned out if you don't like the look. Because the water-wise garden is a public garden, we prune off the spiky tips of this plant, which can be quite sharp. Like many succulents, Aloes are from South Africa. 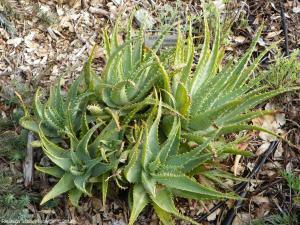 Aloe striata tolerates cold better than most aloes and grows successfully in the Bay Area. The large, broad, fleshy leaves and tall clusters of flowers are bold additions to the summer-dry perennial bed. As a bonus, hummingbirds and bees are attracted to its orange-red blossoms. After that flowers have dropped off, we cut back the inflorescence. That's the only maintenance this plant needs. Aloe striata is easy to propagate too. We just remove the pups (baby plants) from the base of the plant, let the stems dry and harden, and then plant the cuttings in a pot of cactus soil mix. Spider aloe has to be the slowest growing succulent ever! Still it worth adding to a small garden because the plant has an interesting form -- almost like a piece of modern sculpture. And you don't need to worry about it outgrowing its space or crowding its neighbors. 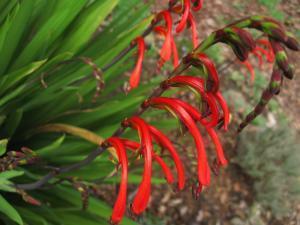 In the winter spider aloe is rumored to have red flower spikes that are attractive to hummingbirds. Unfortunately, we can confirm that because the plant in the Palo Alto has never bloomed.. This plant is frost tender so be sure to protect it on cold winter nights. Spider aloe is striking and very undemanding. It makes an excellent specimen for a small low water garden. Columbines are great plants for woodland areas. Their blooms are delicate and lovely. In the summer, the foliage tends to die back, but the flowers more than make up for this. 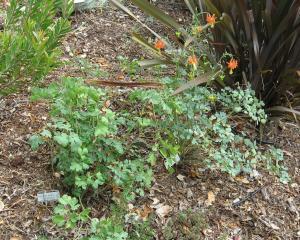 Aquilegia eximia, a California native, is a UC Davis "All Star" plant. The Palo Alto Demonstration Garden planted Aquilegia eximia in partial sun and it hasn't done as well as we would like. We are now trialing it in a shady spot. The plant may just need more water than we provide at the Palo Alto Demonstration Garden. 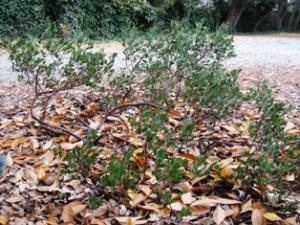 'Emerald Carpet' is a slow growing California native manzanita from the coast of Mendocino County. It is a very attractive plant with dark glossy leaves, reddish stems and small flowers in the early spring. We have mixed feelings about 'Emerald Carpet'. Although it has not died, it has not thrived either. We suspect that it needs more water than most manzanitas. It is in a part of the garden that gets no water. Some Santa Clara Master Gardeners have had success using the cultivar 'Carmel Sur' as a ground cover in low water landscapes. 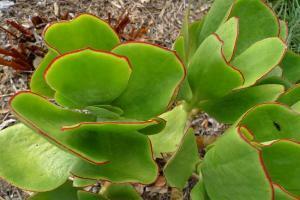 There are many, many different cultivars of manzanita ranging from ground covers to small trees. Manzanitas are a good wildlife plant and typically tough as nails. They do well in very dry situations. Most manzanitas need superb drainage or they will struggle and die. Plant on a mound or slope and water weekly for the first summer and less after that. By the third summer, stop watering. Avoid fertilizing the plant. These plants rarely need pruning. Remove the odd branch that dies back in the late summer and the plant will fill in. Some gardeners will remove the lower branches on some of the larger manzanitas to highlight the interesting branching structure and reddish bark. California native Arctostaphylos 'Howard McMinn' is reputed to be the manzanita most tolerant of typical garden conditions. Manzanitas in general need excellent drainage. In heavy clay soils, be careful not to over water or over fertilize. If the tips of Arctostaphylos branches are pruned, this large shrub will become very dense and make a good privacy screen. At the Palo Alto Demonstration Garden, we have chosen instead to remove the interior stems and leaves to expose the interesting red bark. This is a good approach if you want the shrub to be more of a focal point instead of a background plant. We planted three 'Howard McMinn' manzanitas at the entrance of the Water Wise Garden. They have struggled there over the years. Damaged by foot traffic and the occasional joy rider, they have not lived up to their reputation. Now, they are receiving too much shade as the oak trees reach overhead. How much longer will we keep them? 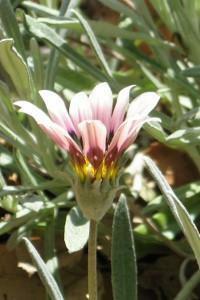 This African daisy begins blooming in the winter and continues until the weather gets hot. 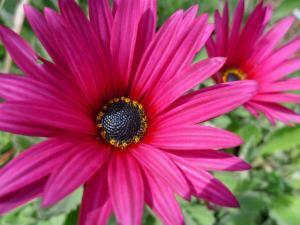 Other varieties of African daisy will bloom through the summer. 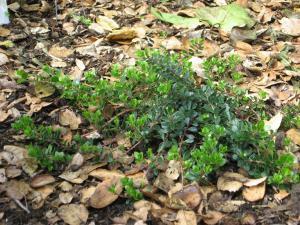 This plant is a low growing ground cover with gray felty leaves that are attractive even when there are no flowers. At our Palo Alto Demonstration Garden we have repeated plantings of 'Purple Torch' throughout the front of our beds to unify the garden. 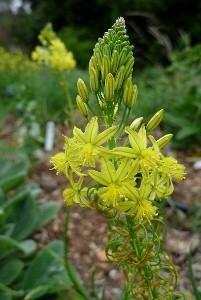 It combines well with Bulbine frutescens, which blooms at approximately the same time. We do not consider this to be a low maintenance plant. To keep Arctotis looking its best, the flowers should be regularly deadheaded when past their prime. If you have a lot of Arctotis planted in your garden, it can be a chore. Cuttings root easily in the cool months and that's a good thing because Arctotis looks best when replaced every few years. 6 - 12 in. high can spread 15 - 18 in. 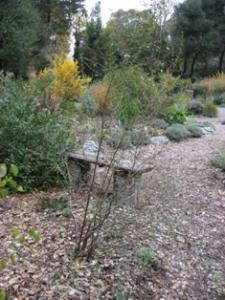 We have used Artemisia 'Seafoam' as a small edging plant in the Palo Alto Demonstration Garden. 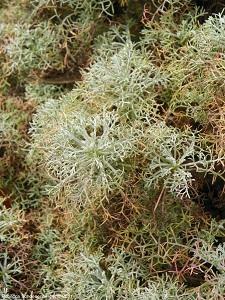 The leaves are silver and frilly, which add a nice texture to the garden. We have repeated silver foliage plants around the edge of the garden beds as a way of tying different beds together. 'Seafoam' has its challenges. The plant wants to bloom, but then it dies back after blooming. Cutting off the yellow flowers to keep the plant looking good may be more work than many of us want to do in the garden. We have found it to be a short lived perennial that needs to be replanted after several years. This California native boasts large, shiny, heart-shaped leaves that give the plant a lush, almost tropical look. We think the leaves, which can be two to four inches long and up to seven inches wide, are really lovely. 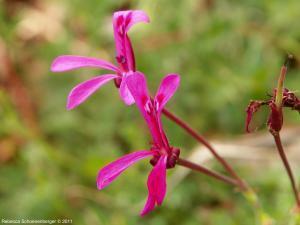 They tend to hide the interesting maroon flowers that bloom in late winter or early spring. 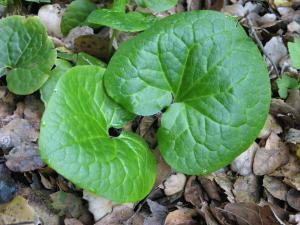 Asarum caudatum grows naturally in the coastal redwood forests and prefers a cool, moist environment. In Santa Clara County gardens with their coastal influences, wild ginger can do well on a low water diet if given a nice shady spot and rich soil full of organic material. In our Palo Alto Water Wise Garden, ginger disappears when it is unhappy (in the dry summer months) and reappears when the conditions are more to its liking (after the winter rains). It may need more irrigation to keep it from going dormant during the summer months. This plant is extremely low maintenance. All it seems to need is the occasional removal of old leaves. 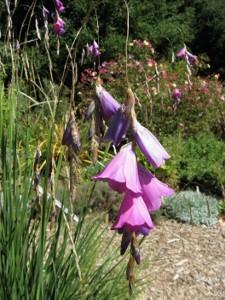 This California native is a low growing, late summer bloomer that shines when much of the garden is quiet. It works well in the front of a low water perennial bed or native plant border. 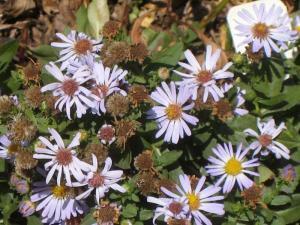 California aster looks better if regularly deadheaded. After it is done blooming in the fall, we recommend shearing it back to to the ground to keep a tidy look in the garden. The plant will cheerfully return when winter is over. California aster was a new plant in the Palo Alto Demonstration Garden and we found that it spread very rapidly even without supplemental water. We have removed it from the native plant bed. It might work better in a situation where a rapidly spreading plant is needed for erosion control rather than in a small, mixed perennial bed. This plant is a great way to get dramatic foliage color into the garden. 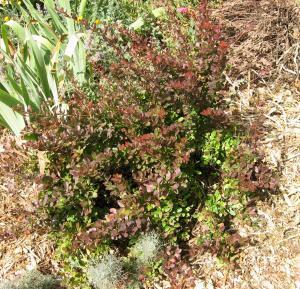 When planted in full sun, the small leaves on this spiny, naturally graceful plant are a deep purplish red. The purple red leaf color contrasts nicely with the yellow flowers that appear in spring. If grown in semi-shade, the foliage takes on a greener cast. In the fall, the leaves turn a vivid red before falling. The small size makes this plant an easy addition to any garden. In our original planting we used three pygmy barberries along the front bed. Unfortunately, only one plant survived, but it is doing well. Barberries are slow growing plants and in the Water Wise Garden they were slow to get established. More frequent watering would have benefited these plants. 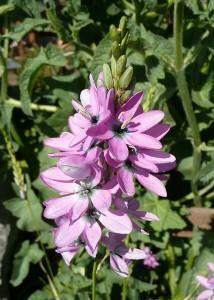 This South African native is a great plant to mix into your low water flower border. 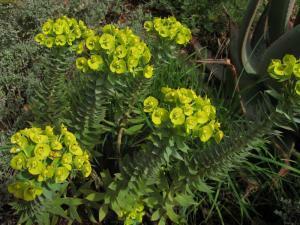 It is evergreen, has spikes of star-shaped yellow flowers and cool fleshy pencil-shaped leaves. We want these plants for our home gardens! The yellow-flowered Bulbine frutescens blooms mostly in the winter when very few plants are in flower. The cultivar, 'Hallmark', which we have also successfully grown in the Palo Alto Demonstration Garden, is more compact, has orange flowers and blooms in the summer. Though it looks best when watered several times a summer, Bulbine can survive on less water. When Bulbine starts to flop open in the center, it is time to dig up and start fresh by planting a piece of the original plant. Digging up Bulbine is not the easiest easiest garden job, but the cuttings will grow without much special treatment. Just stick them in the ground and wait for a new plant. The best time to start a new plant is in the rainy season. 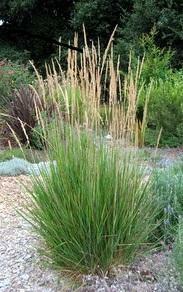 2-3 ft.. tall and wide, flowers to 6 ft.
Calamagrostis is a wonderful vertical accent in the garden. We have used two plants to mark an entryway to the garden. They can also be massed to make a low growing screen. In late winter we have cut these grasses back to several inches above the ground to renew the plants. Other years we have simply raked out the old growth in the spring. 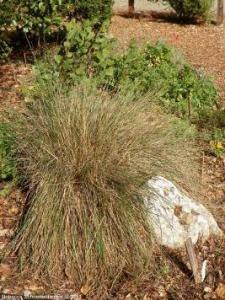 Either way, these grasses are extremely low maintenance plants with a big impact in the garden. Callistemon 'Canes Hybrid' is a beautiful shrub that adds height and structure to the perennial garden. 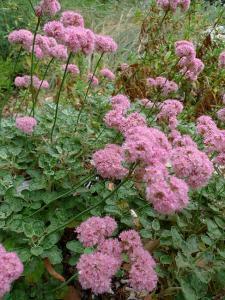 We especially like its soft pink flowers that bloom repeatedly throughout the summer. The cultivar 'Canes Hybrid' is smaller and has softer, greyer foliage than the more common red Callistemon citrinus. Callistemon are very adaptable plants for our area and the hummingbirds love them. There are many cultivars of Callistemon ranging from tree-size to shrub-size to ground cover height. We haven't prune the Callistemon in our garden yet because we want it to be tall. When it gets to the size we are looking for we will use pruning to shape it and keep it shrub-sized. The Callistemon in our photo is next to Miscanthus sinensis 'Yaku Jima' -- an excellent plant combination. This is a very showy, low growing perennial. The flowers, which appear in mid-summer, are bright yellow. The delicate, lacy foliage is also an attractive addition to the garden. It is native to the southwestern US and northern Mexico. This is a new plant in our water-wise garden, so we don't have a lot of experience with it yet. Sunset's Western Garden Book suggests shearing before spring growth. The stems on this plants can become woody, but that hasn't happened in our garden yet. Foothill sedge is one of our water wise winners! 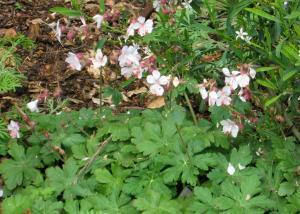 It makes a lovely informal ground cover in shady areas. With occasional water this plant stays green over the entire summer. Foothill sedge will survive full sun, but can begin to look ratty in the summer. This plant was once considered a California native, but that has recently been disproven. 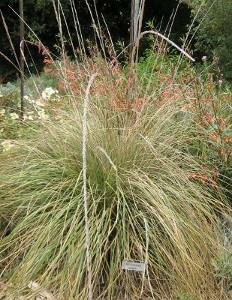 The new name is Carex divulsa, but you will still find it sold as Carex tumulicola in nurseries. At the end of winter, many people cut this plant back to several inches above the ground, but we have not had to do that. Because our plants are in the shade, they never seem to get tattered looking. We have not had a problem with Foothill sedge reseeding. This may be because we mulch extensively with bark and use drip irrigation in the water wise garden. We recently removed a Carpenteria shrub from our garden because it was crowding other plants, but the shrub has definitely been a winner in our garden with its pretty leaves and cheery 'egg over easy' flowers. We have another one on order and are looking for the right spot in the garden to showcase it. 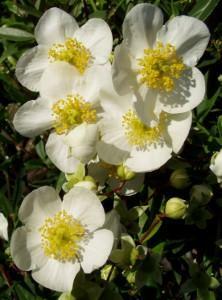 Carpenteria is an evergreen shrub and works well as a background shrub or in mixed plantings under oaks. It is a fairly flexible plant. It will tolerate light to moderate water and full sun to partial shade. One drawback of this plant is the brown leaves don't always drop off in summer. If this shrub is in a very visible spot, you may want to cut off the brown leaves for a cleaner appearance. Last fall we radically pruned our Carpenteria to rejuvenate it and control its size. We will be trying the variety 'Elizabeth', which is supposed to be a smaller plant with more abundant flowers. Carpenteria californica is a UC Davis Arboretum All-Star and a California native. 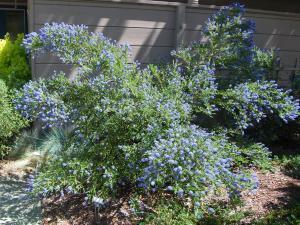 Ceanothus is a California native evergreen shrub. It is very showy in late winter and early spring when it covers itself with beautiful blossoms. 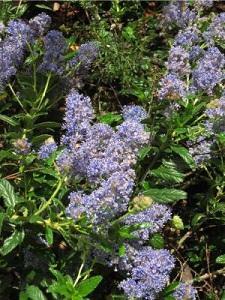 Most Ceanothus have blue blooms that are very attractive to bees and other insects. There are many different kinds of Ceanothus. Some are low growing ground covers, some are shrubs and some become tree-like. Most Ceanothus need to be planted in a dry part of the garden because they are very sensitive to summer watering. Ceanothus varieties originally from the coast, such as 'Carmel Creeper', are more tolerant of summer water. You should research cultivars carefully to select the right plant for your garden situation. A good resource is California Native Plants for the Garden written by Carol Bornstein, David Fross, and Bart O'Brien. Ceanothus can be tricky to prune. It is best to prune them in the late summer when they are dormant. Take care not to cut into large branches -- only prune branches that are an inch or less in size. Even with proper pruning and watering, these plants can be short-lived (five to ten years), but their beautiful spring flowers more than make up for any challenges. Ceanothus 'Concha' is one of the best Ceanothus cultivars for our area. It is more adaptable to typical garden environments than many other Ceanothus, tolerating heavy clay soil, drought or summer watering. Over watering will shorten the life of any Ceanothus so be sure to allow the soil to dry between waterings. 'Concha' has rose colored buds that open to cobalt blue flowers in late winter or early spring. Leaves are small and a deep dark green. Ceanothus 'Concha' is a California native plant. Ceanothus x pallidus 'Marie Simon' is an interesting plant. It is a cross between a native Ceanothus and another unknown plant. As you can see, it looks very different from a native Ceanothus. 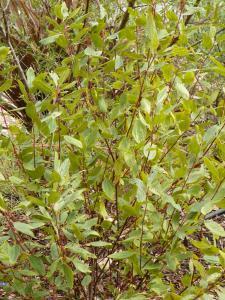 It is semi-deciduous and has red stems and light green leaves. Instead of blue flowers, this Ceanothus has delicate pink flowers. If you look at photos on the Internet, you will see a plant covered with pink flowers. We haven't had that kind of luck with our plant yet. The flowers have been pretty but sparse and the plant does not look vigorous. Is this plant a keeper? We'll get back to you on that. It has been in the garden three years, but it is quite a slow grower. It may take several more years before this plant shows us its stuff. Update: Several year later, Ceanothus x pallidus is still a non-performer in the Palo Alto Demonstration Garden. We can't recommend this plant for low water gardens in the Palo Alto area. Ceanothus x pallidus 'Marie Simon' is a UC Davis All Star. We wish we had a picture of a Western redbud in full bloom, but our five year old plants have not produced many blooms. The book, California Native Plants for the Garden, says this tree will bloom more profusely with winter chill and full sun. The magenta flowers are quite a sight in the early spring. After blooming this small multi-trunked tree or large shrub has pretty heart-shaped leaves. This California native is an excellent choice for a small space or an edge of woodland design. After the plant blooms, Western redbud sets distinctive seedpods. We can't say we are crazy about how they look, but the gorgeous flowers help us put up with them. Like many natives, this plant needs good drainage, so consider planting it on a mound. Avoid summer water. Cercis can be pruned over the winter to open up the branching structure to give the plant a more tree-like appearance. 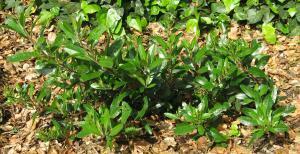 Cercocarpus is a useful informal hedging plant. It can also be pruned into a small tree. In the Palo Alto Demonstration garden we have it planted on the edge of our garden in an infrequently watered bed. It provides a buffer to the ivy cover area beyond our demonstration beds. The plant is evergreen, which adds to it usefulness as a screening plant. We were recently inspired by a picture in Plants for Summer-Dry Climates to prune this Cercocarpus to have a more open form. It is very hard to see from this photo, but it is now a very attractive, airy shrub. This plant has been very slow growing for us, so we hope it will not be difficult to maintain this form. Sunset says this plant requires full sun, but it has does just fine in an area that receives some shade. Because it is a California native from the foothills, it can get by on little to no water once established. Because this plant is so slow growing, the only maintenance we've had to do is light pruning to keep its open branching form. The plant has had no problems with pests or diseases. 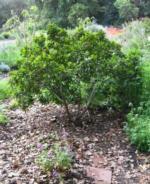 Cercocarpus is a soft and elegant looking shrub that we think should be planted more frequently in Bay Area gardens. Chasmanthe is one of the South African bulbs that does so well in our climate. Foliage appears in the fall, orange-red flowers appear in the winter and then the plant goes dormant in the summer. There is also a yellow flowered version, called Chasmanthe floribunda duckittii. Chasmanthe needs no summer water. Late frost can damage blooms. To prevent overcrowding, corms (bulbs) will need to be divided every two to three years. Also, diligently deadhead the flowers as this plant will reseed vigorously (invasively!) particularly the Chasmanthe aethiopica! Chondropetalum is a low water plant from South Africa that has a nice reed-like look. In the Palo Alto Demonstration Garden we've used it on the edge of a dry creek bed. Many garden designers favorite it as a specimen for its strong architectural lines. It is often use in modern designs and in pots as the "thriller". Overwatering the plant will make it floppy. We carefully remove old stems to highlight the new growth. Chondropetalum can also be sheared to ground just as new sprouts start to show. We also tried planting Juncus, a similar looking plant, but found it did not do well with once every three weeks watering. This hot pink rockrose was a long blooming, low growing shrub in our water wise garden until it got crushed by a Teucrium. Even though we had to remove it, we will be looking for a new spot to showcase this reliable performer. 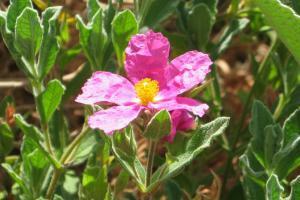 There are a number of different rockrose cultivars. Some grow up to 6 feet, some have white flowers, and others have lavender flowers. Rockroses thrive in hot, dry areas. They like well draining soil and will quickly die if overwatered. Our experience has been they will die within two years in a regularly watered landscape with clay soil. 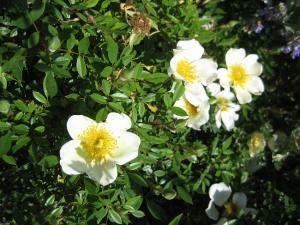 Our rockrose was planted on a berm (small hill) and received minimal summer water. You can prune this plant to shape it, but don't cut into the wood because it may not resprout. Correa is a plant that doesn't get used enough in Bay Area gardens. Let's list its attributes: it thrives in sun, partial sun, or shade; it is deer resistant and bird friendly; it has pretty, long-lasting flowers that provide winter color; it does well with moderate to occasional water, it does not get too big, it tolerates our alkaline soil, and it is evergreen. What's not to like? Well, some Master Gardeners have found Correa to be short-lived in their home gardens. At the Palo Alto Demonstration garden this plant is still going strong after several years in the garden. 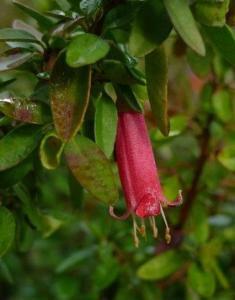 Look for some of the newer cultivars of Correa that have been bred to have flowers more visible above the foliage. One more thing -- this shrub requires no deadheading or pruning. It is practically maintenance-free! Correa alba looks very different from the more commonly grown Correa 'Dusky Bells'. The flowers are more open and less downward facing than other Correas. The foliage is fuzzy on the back side and the stems are bronzy brown. Although Sunset says Correa alba is a summer bloomer, this picture was taken in late fall. This shrub can get to be 8 feet by 8 feet, but we keep it more compact in our garden by regular pruning. If you plant this shrub in a big enough spot, you can avoid having to prune your Correa. Correa is a plant that doesn't get used enough in Bay Area gardens. Let's list its attributes: it thrives in sun, partial sun or shade; it is deer resistant and bird friendly; it has pretty long-lasting flowers; it does well with moderate to occasional water; it does not get too big; it tolerates our alkaline soil; and it is evergreen. What's not to like? Well, some Master Gardeners have found Correas to be short-lived in their home gardens. Another issue can be scale on the stems if the plant gets very dense. Sunset notes that this plant is sensitive to overwatering and overfertilizing. 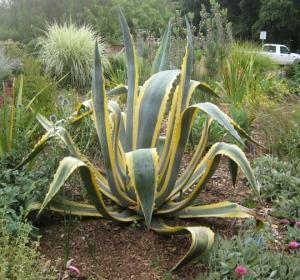 At the Palo Alto Demonstration garden, this plant is still going strong after several years in the garden. The beds in Garden are mulched with wood chips, but not fertilized and watered deeply with drip irrigation once every three weeks. We love this Cotyledon cultivar with its bright green, red-edged leaves. Many summer-dry plants have small, fine leaves; Cotyledon with its brightly-colored, fleshy leaves adds a much needed PUNCH to the garden. This is especially important during the quiet months in the fall and winter when not much is blooming. Like many succulents, Cotyledon is easily propagated from cuttings and does well in containers. According to Sunset's Western Garden Book, Cotyledon does better with some protection from the hot afternoon sun. In the Palo Alto Demonstration Garden, some of the plants are in full sun and seem to do just fine. Cotyledon also seems more cold tolerant than many of the succulents we have trialed. We have never experienced any frost damage with this Cotyledon. Fairy wand, also know as Angel's fishing rod, has stunning flowers on long arching stems. It is definitely a "what is that?!" plant when it blooms in late spring and early summer. Be sure to put it in a spot that will showcase its tall blooms. Sunset's Western Garden Book says this plant needs regular water, but we've gotten by with our once every three weeks watering regime. When fairy wand gets too big, we have successfully divided the corms and replanted them in new spots. This plant can self-sow but in our garden, with our heavy mulching, this hasn't been much of a problem. If reseeding is a problem in your garden, you may want to deadhead the flowers before they set seed. Fairy wand is usually evergreen in our climate, however, we cut back the leaves after they start looking ratty in mid-summer. Otherwise this is a pretty trouble-free plant with a big impact when it blooms. Echeveria is a nice filler or edging plant for the summer dry flower border. Echeverias also do well in pots. The sculptural quality of the fleshy leaves provides a nice contrast to the more delicate leaves of many perennials. For gardeners at the Palo Alto Demonstration Garden part of the charm of this plant is watching the hummingbirds enjoy the flowers. 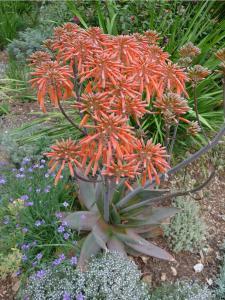 Our water-wise garden features the UC Davis "All Star" cultivar 'Imbricata'. Echeverias are often referred to as 'Hen and Chicks', but so are Sempervivums. One of the the problems with using common names is they can be confusing. In this case, it is better to use the botanical name, Echeveria. Some Echeverias do well in full sun, but the cultivar in the Demonstration Garden seems to do better in half shade. We have also found that Echeverias seem to do better with a drip very close to their roots. 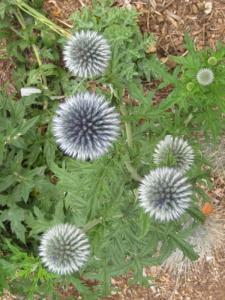 Echinops has beautiful blue flowers beginning in the spring and continuing through the fall. The coarse leaves may not appeal to everyone, but we think they add an interesting texture. The flowers of Echinops make a great cut flower. The spiky texture adds interest to flower arrangements. To encourage new blooms and keep the plant looking fresh, remove the entire flowering stalk. Even with minimal water and no fertilizer, we find these plants need stacking. When we put supports in place in the early spring, they are quickly covered with foliage and hidden from view. If you are searching for a summer blooming California native, put California fuchsias at the top of your list. Hummingbirds love them and so do we. There are a number of cultivars out there, but one of our favorites is 'Select Mattole'. 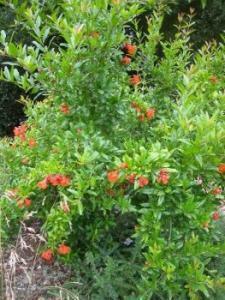 It has wonderful silver foliage and sweet red orange tubular blooms. We love the fact that it is well behaved -- it stays compact and doesn't spread. The book California Native Plants for the Garden recommends cutting California fuchsias back to one inch stubs in the fall and winter. The book also suggests pinching the outer tips in late May or June to prevent flopping. 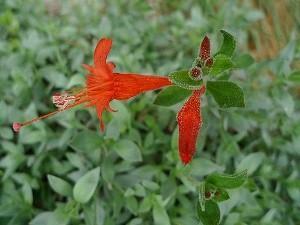 With 'Select Mattole' we haven't found this to be necessary, but with other California fuchsias you might want to give this a try. We have learned that California fuchsias look better with a once a month deep watering. It is not critical, but you will have a lusher looking plant with occasional water. We've been growing Erigeron glaucus 'Wayne Roderick' in the Palo Alto Demonstration Garden for several years now. The cultivar 'Wayne Roderick' is supposed to be longer lived, have larger blooms, and be more durable and heat tolerant than the species. Our experience with Erigeron 'Wayne Roderick' has been very good, although we have noticed that the foliage burns in the summer unless given more frequent water. This plant has a long bloom period with regular deadheading. Ours starts blooming in the spring and continues into the fall. To keep this plant looking its best, we prune leggy growth back to 1 or 2 inches in the late fall. 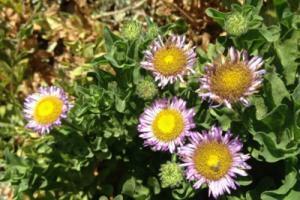 In the Palo Alto Demonstration Garden Erigeron glaucus 'Wayne Roderick' has been a winner. We would recommend to anyone looking for a plant with a very long bloom period. Rosy buckwheat, a California native from the Channel Islands, has pretty rosy flowers in summer. It is one of the most showy and most compact of the buckwheats. 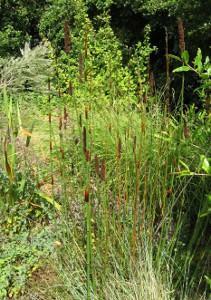 Because of its size and neat growth habit, it makes a great filler plant in a native garden. Rosy buckwheat shines in late summer when the flowers turn from rosy to a coppery tint. The mellow colors of this plant blends well with other perennials. At the end of the coppery color phase we suggest you deadhead the blooms as they can get really ratty looking. Every couple of years we do a light pruning to new growth below the taller branches. The best time to do this pruning is in the late fall before the winter growth starts. You may also want to shape this plant every so often to keep its mounding form. Buckwheat will require some summer water the first year it has been planted. After the first year, avoid summer water. Although some sources say these plants live only three to five years, we have found these plants to be longer lived. Buckwheat freely reseeds so you won't have to buy new plants. To provide design unity in our water-wise beds, we like to have one or more plants repeat in all the beds. In the spring, bright orange California native poppies fill that role in our garden. 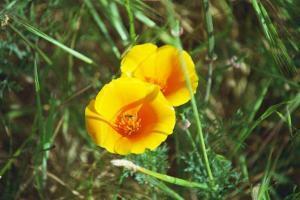 Although California poppies are perennials in our area, they can be treated as annuals. California poppies can be problematic because they are aggressive reseeders. They must be heavily thinned out in areas you want to keep them and removed in areas you don't want them. They can get to be a sizable one and a half feet wide and can smother other plants. California poppies look great in wild areas and are lovely massed. They make excellent temporary fillers if you are starting a new bed with small plants. California poppies can get by on almost no summer water, but they tend to look shabby and weedy under these conditions. To encourage continuous bloom, you should provide moderate amounts of water and trim the plants back to almost ground level when the foliage turns grey and the plants lose their flowers. Most retail nurseries and many hardware stores sell seeds for California poppies. Larner Seeds, a mail order company, is a good source of seeds for some of the less common varieties of these California natives. Plant seeds in the fall for a spring show. Be sure to cover seeds with mulch to hide them from the birds and water regularly until they sprout if the winter rains have not arrived. Euphorbia myrsinites has a wonderful texture as you can see from this picture. It makes a good ground cover for dry areas. Like all the Euphorbias, these plants have very showy flowers in the spring. Be sure to cut off the flowering stalks to the base before seeds develop. These plants will reseed vigorously if you do not deadhead. When deadheading, be sure to leave the new growth intact. These will be next spring's flowers. Take care when you cut Euphorbias. They have a sap, which can be very irritating to the skin. These perennials from the Mediterranean Basin have done very well in the Palo Alto Demonstration Garden. Euphorbias are tough as nails. The chartreuse or lime green flowers appear in late winter and hold well through spring. Euphorbias are very showy in the winter garden and continue looking good during the hot summer. Euphorbias can be aggressive reseeders so cut off the flower stalks at the base sometime in May before they set seed. Be careful of the sap as it may irritate the skin. We let the cuttings dry an hour before tossing them in the recycling bin. Hundreds of varieties of Euphorbias are available ranging from groundcovers to shrubs. Festuca californica is a commonly planted California native. It is larger than many of the Festucas, reaching two feet or more in height. It has a softer more arching habit. We have found it goes summer dormant with infrequent summer watering. This plant is tough and resilient. 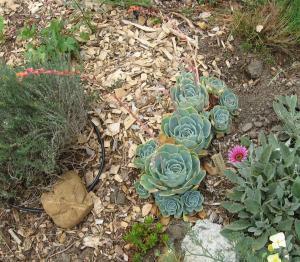 Unlike many California natives, this plant can take moderate water and will stay green and lush with regular watering. To keep this plant from reseeding, be sure to deadhead in early summer. Blue fescue is a small, evergreen bunch grass with narrow blue-green leaves that form a mound. The fairly insignificant flowers appear in early summer. This grass needs occasional water and good drainage. It tends to brown out in the middle, but can be divided and replanted to renew it. In a low water garden, these grasses seem to hold their blue green color better in the shade. In the Water Wise Garden we have removed most of these grasses. We had hoped to use blue fescue as an edging plant throughout the garden beds, however, in our opinion, only a few looked good enough to keep in the garden. Idaho fescue is common native grass in California and many other western states. We have planted a number of Festucas, including Idaho fescue, in full sun and they look brown and scraggly during the summer months. Festucas seem to perform much better in dry shade. In the Palo Alto Demonstration Garden we are in the process of removing Festucas from sunny areas of the garden and transplanting them to shadier spots when we have room. Miscanthus, another type of grass, does better in full sun. It is not a perfect substitute for Festucas because of its larger size. The Palo Alto Demonstration Garden is still searching for a grass that is low growing and does well in full sun with limited water. Can edibles be ornamental? Yes! 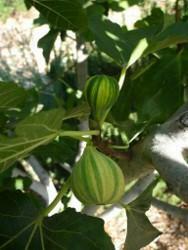 Tiger figs have beautiful striped green fruit in the fall and large attractive leaves. Unfortunately the fruit on this cultivar requires a long warm season to ripen. For eating, we usually recommend 'Black Mission', a cultivar that is more likely to ripen in Palo Alto. Every year we have pruned our two fig trees hard to keep them from overwhelming our modest sized beds. While our radical pruning has kept the trees under control this may be more work than the average homeowner wants to take on every year. We recently decided to remove our two tiger figs and replace them with a dwarf fig cultivar called "Black Jack". There are some out there who look down on Gazanias as gas station plants, but hey, we love colorful, easy to grow, low water plants. We've repeated Gazanias along the edges of the garden to help tie together different beds. The cultivar we grow has silver foliage that works well with other Mediterranean plants. Gazanias do better with occasional water. With regular water, they seem to become leggy. We deadhead tired blooms on our Gazanias, but you don't have to. When a clump of plants becomes too crowded or too large, take cuttings during the cool season and plant them around the garden. This is a pretty ground ground cover for dry shady areas. The pale pink flowers have a long season and look great with anything from roses to California native shrubs to coast live oaks. We have used it as an edger. It's easy to propagate and transplant to new areas. Just cut off a small piece, plant it directly in the soil and keep it wet until the plant roots. Sunset recommends shearing this plant in the fall to get fresh growth in the spring. We haven't tried shearing 'Biokovo' yet in the demonstration garden, but plan to experiment with cutting this plant back. The only drawback with the plant is if you fertilize your soil and water regularly, Geranium 'Biokovo' will become aggressive and spread quickly. Neglect it and will be a workhorse in your garden. 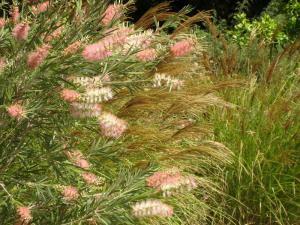 Grevillea is one of our favorite no fail plants. It's not showy, but it is tough, deer resistant, loved by hummingbirds, and a fall to spring bloomer. The Grevillea in this picture is a dwarf form of Grevillea rosmarinifolia. It has evergreen rosemary-like leaves and stays a nice size for a perennial garden -- 3 ft. high and 6 ft. wide according to Sunset. It's a nice combination to have flowers in the winter when not much is blooming and a tidy, low growing shrub in the summer when other plants take center stage. 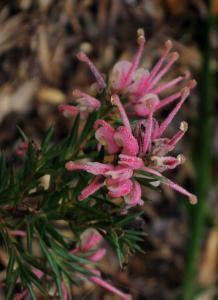 Sunset says there are over 250 species and hybrids of Grevillea. Some have fine leaves, others have courser leaves. Some make great ground covers, others grow to be the size of the small trees. Some tolerate cold weather weather better than others. Research carefully cultivars carefully before going to the nursery. Dwarf Grevillea is practical choice for planting in a parking strip that challenging area between the sidewalk and road. For safety reasons most cities require plants shorter than 3 feet in areas next to roads. Grevillea does well getting a deep watering once every three weeks. We've also seen it do well in gardens that get regular water. Be careful of using fertilizer with phosphorus around Grevillea. There is no maintenance required for this plant. No deadheading or trimming back, it really is easy peasy! A low-growing, trailing ground cover from Turkey, Helianthemum is covered with small flowers in the spring. There are many cultivars with different flower colors -- red, apricot, yellow, pink and white. 'Henfield Brilliant' is a striking form with its silvery leaves and orange flowers. Shear the dead flowers off to encourage repeat blooms. 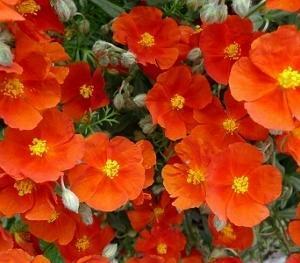 Helianthemum likes full sun and well-draining soil with low to moderate water. Toyon is an attractive dark green, large shrub that can, over time, develop into a small multi-trunk tree. This plant is native to many chaparral areas of California and easily adapts to garden cultivation. It is a member of the rose family, producing small white flowers in early spring that are followed by showy red berries. The berries remain on the shrub for a number of months while they slowly ripen. Once ripe, they attract many different species of hungry, grateful birds. Young toyons may take a few years to settle into the garden but once established they are easy to grow and can be pruned to manage their size or to keep them looking fresh. The toyon in the Water Wise Garden was planted in the winter of 2008 from a one gallon container in a spot where it gets afternoon shade. As you can see from this recent photo, our toyon is still a modest sized shrub several years after planting. There are many different kinds of Heuchera, but one of our favorites is "Rosada'. Heuchera 'Rosada', which was introduced to the nursery trade by the UC Davis Arboretum, is a cross between two different native species from the western U.S.
Heuchera rosada prefers light shade and occasional to moderate water. With beautiful rosettes of low growing foliage and stalks of pink blooms, it is a favorite of woodland gardens. Removing the flower stalks when the plant finishes blooming is all the maintenance this western native needs. Although these plants will grow in full sun, they will need more water to look their best. Plants grown in the shade can tolerate less water. 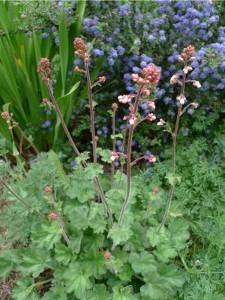 UC Davis Arboretum selected Heuchera 'Rosada' for its "All Stars" series. "All Stars" are easy to grow, reliable, do not need a lot of water, and have few pest or disease problems. Heuchera maxima is a California native plant from the Channel Islands. This heuchera is one of the largest of this genus. It forms a low clump and looks great planted in mass, especially in early spring when the delicate flowers appear on thin stalks above the large green leaves. The flowers are useful as a cut flower. In the Water Wise Garden we have several Heuchera maxima in a shady spot where the soil is quite rich. These plants have grown very large and are stunning in the spring when they bloom. 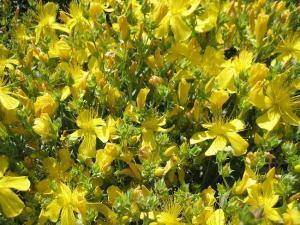 Hypericum reptans, or ground cover St. Johnswort, is a cute ground cover for dry sunny and partially shady areas. The cheerful yellow flowers that appear in the summer really pop. This ground cover form looks and behaves differently from other species of St. Johnswort. It has very small leaves and flowers, grows close to the ground and spreads slowly. We shear the spent flowers off when the plant is done blooming. It is easy to start new plants by putting cuttings directly in the soil when the weather has cooled. We received this Pacific Coast iris cultivar from UC Davis in the spring of 2009, so it is a new plant in our garden. This cultivar is rumored to tolerate full sun better than many other California native irises. 'Canyon Snow' irises are also more floriferous and vigorous than most native iris, which is why UC Davis named this plant to its list of Arboretum "All Stars". 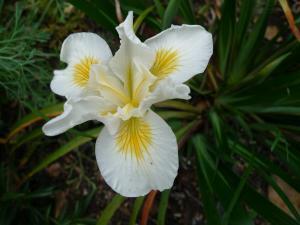 There are many, many hybrids of Pacific Coast iris, some of which are very showy. Flower colors available include white, blue, pink, copper, brown, maroon, and violet. The flowers appear in the spring. Master Gardeners have found that in our own gardens Pacific Coast irises seem to prefer part shade and low to moderate water. Native irises are useful under oaks, in woodland gardens and in meadows. This South African bulb is one of our garden's best kept secrets. The late spring flowers come in pretty jewel tone colors that go well with many spring blooming plants. When it is blooming in the spring visitors always ask us what it is. Ixia is one of the more versatile South African bulbs. Although it doesn't need it, we have found Ixia won't rot if it receives some summer water. We remove the grass like foliage on this plant when it goes dormant (turns brown) in the summer. 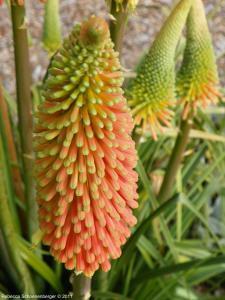 The glowing torch-like flowers of Kniphofia are reliable midsummer bloomers. From a design perspective the flower spikes of these plants provide great vertical accents. Many sizes and colors of Kniphofias have been developed, including reds, oranges, yellows, and near whites. The the flower colors can be dramatic and intense, so take care in selecting flower colors that blend well with your plants. The Palo Alto Demonstration Garden has several Kniphofias including "Christmas Cheer', which is a UC Davis "All-Star". 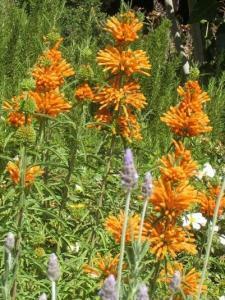 It has brilliant orange buds that open to a deep-gold tubular flower. Kniphofia 'Christmas Cheer' blooms in the fall and winter unlike many other Kniphofias. We deadhead these plants because the old flower spikes are not that attractive. When the leaves start looking shabby in the winter, we cut back the foliage about three inches above the ground. Kniphofia will then come back beautifully in the spring. The plant divides easily when you want to spread it around, but it doesn't seem to need dividing to stay vigorous. Lavenders are a favorite plant for low-water gardens with their aromatic foliage and showy spikes of scented flowers. We have several different types of lavenders in our garden. 'Otto Quast', one of the cultivars we've had success with, is a UC Davis "All Star" plant. 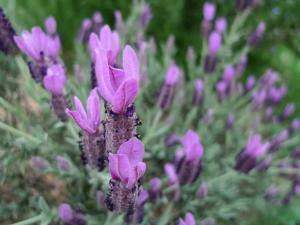 Lavandula stoechas is an early bloomer and will repeat bloom if deadheaded and given supplemental water. Full sun and good drainage are essential for lavenders. Shear the plant after blooming to maintain a neat appearance and discourage the plant from becoming too large and woody. One drawback is lavender is a short-lived shrub that needs to be replaced when it becomes leggy or woody. We are considering replacing our lavenders after about six years in the garden. This upright shrub from South Africa has bright eye-catching orange flowers. A single lion's tail works well as a late summer/early fall garden focal point. The flowers can also be stunning in a flower arrangement. From a design standpoint, we don't recommend massing a large number of lion's tail plants because the strong color can overwhelm a garden. It is a good idea to prune these shrubs in the early spring after the danger of frost is past to control size. Some of our Master Gardeners prune these shrubs down to six inches from the ground; others prune by half. How much you choose to prune lion's tail is just a matter of deciding how large you want these plants to be in your garden. With no pruning at all these plants can get really big, really quickly. Lion's tail can be frost tender but in our experience, they rebound quickly. If this plant does get frost damaged, it is recommended that you cut down to live growth in the spring after the danger of frost is past. Pitcher sage is an aromatic member of the mint family that is attractive in wild gardens. In late summer these plants have reddish purple flowers on medium-sized spikes. Hummingbirds and bees love them, so they add quite a bit of life to a garden. Another nice feature is the plant has large leaves, which is a nice contrast to many plants from the Mediterranean region that have smaller foliage. One caution about these plants: Some reference books say this plant can get up to 6 feet tall, but in the Palo Alto Demonstration Garden they have stayed a modest 3 feet tall and wide. The trick is not to overwater them. Although some pitcher sages are native to California, Lepechinia hastata is from Mexico. 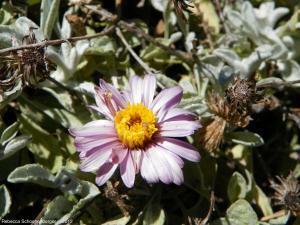 This picture of Lessingia felaginifolia is from the Sunnyvale Demonstration Garden. 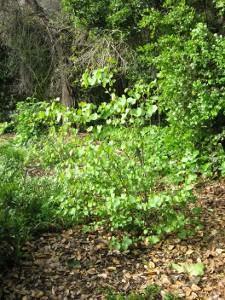 We planted Lessingia seeds in the Palo Alto Demonstration Garden as a groundcover, but ended up removing the plants. We felt Lessingia looked scraggily by the end of summer when it bloomed. Whether you like this plant or not probably depends on your level of fussiness. 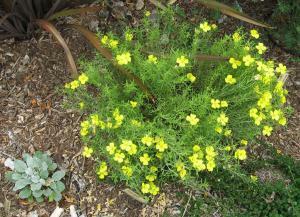 The Sunnyvale Demonstration Garden is a fan of Lessingia and continues to plant it. They cut it back in November to freshen it up. Lessingia is big favorite with butterflies, so the Palo Alto Demonstration Garden is trying it again. We are currently trialing a cultivar called 'Silver Carpet', which is recommended in the book, California Native Plant for the Garden, in the front of the native plant bed. Lessingia 'Silver Carpet' was planted last fall so we are waiting to see how it does in our garden before recommending it. 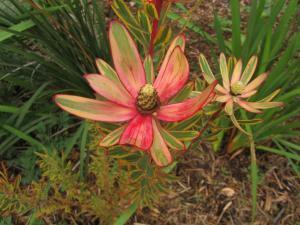 Leucadendrons are evergreen shrubs from South Africa and are related to Proteas. Some Leucadendrons have interesting cone-like heads with colorful bracts that may be used in flower arrangement; others are grown primarily for their foliage. We grow our Leucadendrons on a one foot mound to encourage good drainage. Their color and size add a bit of drama to our beds, especially during periods where other plants are dormant. We have several different cultivars of Leucadendrons in the garden, including this one, appropriately named 'Jester'. 'Jester' is also known as 'Safari Sunshine'. Leucadendron 'Rising Sun', a South African native, has beautiful reddish stems and terminal bracts (colorful flower-like leaves toward the end of a stem). In our water-wise garden 'Rising Sun' is a garden focal point during the winter. We like the cultivar 'Rising Sun' because of its subtle coloring. From a design perspective, the brash colors of the some Leucadendron cultivars can be hard to incorporate into a garden. Some Leucadendron can be frost tender but we have not had any problems with frost damage in the Palo Alto Demonstration Garden. This Leucadendron has stayed small, so we have not had to prune it. The Leucadendron in our demonstration garden may have stayed small because the plant is on top of a gravel mound and receives limited water. We recently removed Rising Sun from the Palo Alto Demonstration Garden because it had a bizarre twisting way of growing that we did not find attractive. Linaria is an old friend that asks for little and gives much. This plant makes a great filler, especially in a young garden. The flowers are small, but the plant is large with many blooming branches. Sunset recommends planting these plants in mass for maximum impact. The big drawback to Linaria is that it reseeds. The seedlings are easy to spot and pull out. If you deadhead the flowers and mulch your soil regularly you will cut down on the amount of reseeding. Many Lobelias need lots of water, but not this lovely red Mexican lobelia, which has done well in our low water garden. It blooms all summer! 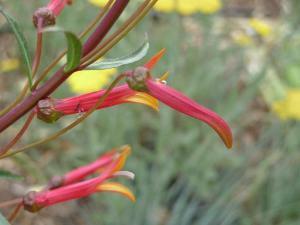 Though very frost tender, Mexican lobelia comes back from the root stock in the spring and spreads vigorously. After frost damage, we prune some of the scragglier branches back to about three feet to make the plant look neater. When danger of frost is gone we prune the plant to the ground to encourage new growth. Mexican lobelia has spread aggressively in our garden and needs regular root pruning to keep under control. We would not recommend this Lobelia for someone looking for a low maintenance plant. Warning: Lobelia may cause serious illness or death if eaten. If ingested, immediately call the Poison Control Center or your doctor. In addition, the juice or sap of the plant can cause a skin rash or irritation. Wash the affected area of skin with soap and water as soon as possible after contact. Mimulus is a cheerful California native that adds bright color to the garden. This shrubby perennial has been hybridized heavily to produce a rainbow of colors. In the wild, different species of Mimulus can be found from southern Oregon to southern California. Happy in sun or part shade, these plants prefer good drainage. With supplemental water, you can expect some repeat bloom all summer. 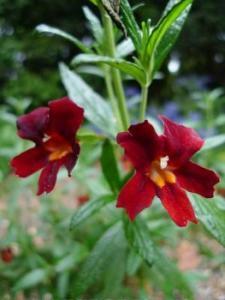 Mimulus is a favorite in native plant gardens because of its color range. When new foliage appears at its base in late winter, the plant is ready to be pruned back to the new green growth. This hard pruning will rejuvenate the plant. If there is no growth at the base, then gently pinch the tips to encourage new growth. Some Master Gardeners have found this plant to be short-lived; other Master Gardeners have Mimulus plants in their personal gardens that are over five years old and doing just fine. These plants are easy to propagate from cuttings and seeds. 2 ft. to 3 ft. wide and tall with plumes rising 4 ft. to 5 ft.
Miscanthus 'Yaku Jima' is a favorite of Roberta Barnes, one of the founders of the Palo Alto Water Wise Demonstration Garden. She has found Miscanthus to be one of the best looking grasses for full sun and low water. There are many cultivars of Miscanthus on the market that vary in size and foliage color including silver and reddish brown. The cultivar 'Yaku Jima' is a U.C Davis All Star plant. From a design perspective, the delicate foliage and showy plumes of Miscanthus add movement and texture to the garden. The plumes look especially lovely in the fall afternoon light. We have not experienced any problems with this grass reseeding in the garden. To keep a fresh look, cut Miscanthus to the ground in winter and divide every few years. That is the only maintenance needed for these trouble-free plants. We have found that sometimes Miscanthus takes a year or so to get established in our water wise garden. Muhlenbergia dubia from the southwest U.S. is one of our favorite grasses for the summer dry garden. 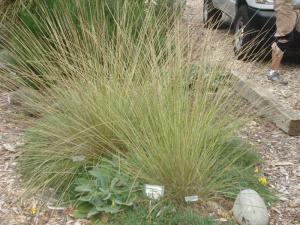 It looks very similar to the more common Muhlenbergia rigens (deer grass), but it is a third of its size. That makes this plant a better choice for pots and small spaces. Like most grasses Muhlenbergia dubia really shines in the fall when its graceful leaves add movement and texture to the garden. In the spring we like to rake out the older growth to encourage new green leaves. Every three years we shear this plant down the ground. That is the only maintenance we do on this plant. Muhlenbergia emersleyi is a wonderful grass to include in perennial flower beds because it doesn't get too big. 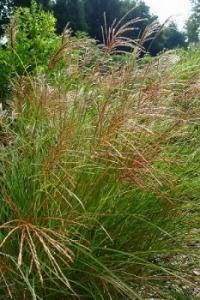 In the late summer and fall this grass has attractive reddish flower spikes on green foliage. The winter form is lovely as well. Some describe the winter color as cream or tan. We say let's call it brown. We have a single specimen in the Demonstration Garden, but we think this grass would look attractive planted in a larger group or even in a meadow. This grass is extremely low maintenance and unlike many other grasses doesn't need to be divided every couple years. To keep this grass looking good, we rake out the old foliage to make room for the green spring growth. The only downside of this plant is that it can be hard to find in nurseries. It is well worth requesting from a nurseries as a special order. 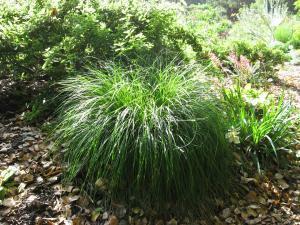 Grasses are the backbone of late summer and fall dry perennial gardens. We love the movement and texture they add to gardens. 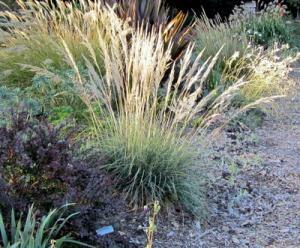 The graceful leaves of grasses look particularly beautiful when highlighted by the late afternoon sun. Muhlenbergia rigen is a reliably pretty California native grass. The flower stalks are persistent and look attractive year-round. We've used it as an accent plant in our native and non-native beds with good results. The UC Davis Arboretum, which has selected Muhlenbergia as one of their "All Stars", suggests using it as a low informal screen. 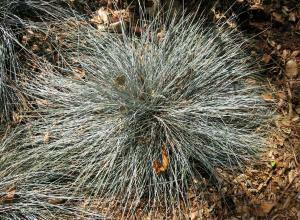 Muhlenbergia requires very little maintenance in our water-wise garden. UC Davis recommends shearing Muhlenbergia a couple inches above the ground in the early spring every three years to encourage new green growth. 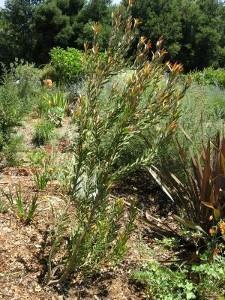 California Native Plants for the Garden suggests periodically raking out dead foliage with a fan rake. Otherwise, this is a maintenance-free plant. 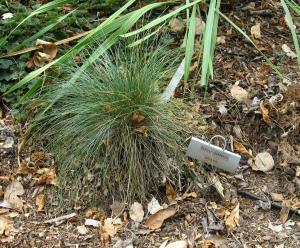 The Palo Alto Demonstration Garden also grows Muhlenbergia dubia, a smaller cultivar. We have found this to be an attractive low-water plant, although the UC Davis Arboretum suggests giving M. dubia slightly more water than M. rigen. 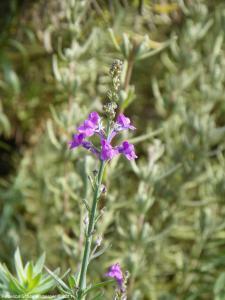 Catmint was one of the earliest plants in the demonstration garden and it provided much needed color the first summer. Catmint is a wonderful edging plant for perennials borders. We have used it extensively in the Palo Alto Demonstration garden to visually tie the beds together. 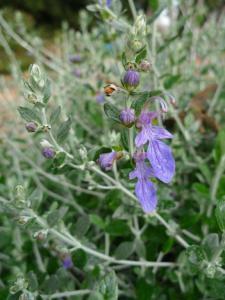 It has lovely soft gray leaves and lavender-blue flowers in the spring. After the first set of blooms finishes we like to cut back catmint several inches to keep it from getting leggy and to encourage another set of blooms. After seven years in the garden, it might be time for us to divide this plant. This is a fun job because catmint leaves have a wonderful smell. Be aware that some cats also love the smell of the plant and will roll their bodies in the plant and flatten it. We enjoy mixing herbs in ornamental plantings. 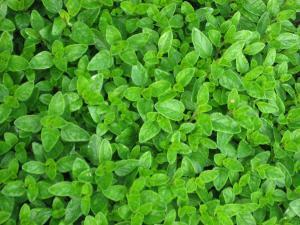 Herbs like oregano are very attractive and thrive under tough conditions. Some oreganos are grown for their aromatic qualities, others for their interesting foliage and others for their attractive flowers. 'Hopley's, a variety with purplish pink flowers looks good in pots. 'Aureum', the variety shown in this picture, looks better with morning sun. The hot afternoon sun can bleach its leaves. Herbs are great for attracting beneficial insects to gardens. Also the less they are watered, the more intense the flavor. Many oreganos benefit from being sheared to the ground in the fall. You can harvest oregano any time for cooking, but the intense flavor will be right before the plants bloom. 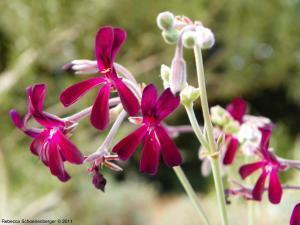 Pelargonium ionidiflorum was recommended to us by Jeff Rosendale of Rosendale Nurseries. It has quickly become one of our favorite front of the border plants. It stays low and compact and seems to do well in partial shade. We love the bright pink flowers. Another plus, this plant blooms throughout the year. So far the only maintenance we do is occasional deadheading. Unlike many other Pelargoniums, this plant seems to stay compact and not get leggy. This plant is highly recommended for low water Bay Area gardens! We love Pelargonium sidoides elegant dark purple flowers and dense mound of silver-gray, heart-shaped leaves. Masses of the dark purple flowers keep coming all the way through mid-December with or without deadheading. Even without flowers, African geranium still looks great in the garden because of its attractive foliage. This is a geranium that thrives in low water situations and in full sun. We've also seen it do well in part shade with generous water. This cultivar seems to be more cold hardy than other Pelargonium. The only regular maintenance it needs is occasional deadheading of spent flowers and that's only necessary if you enjoy deadheading. All in all it doesn't seem to be a very picky plant. Like most Pelargoniums it is very easy to propagate from cuttings. This is a very reliable, long-blooming California native that thrives in the Palo Alto Demonstration Garden's native plant border. Penstemon 'Margarita BOP' is a UC Davis All-Star because it does well in average garden conditions. 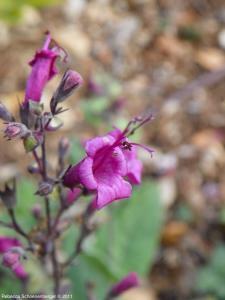 Unlike many other California native plants, Foothill penstemon can tolerate some summer water. The bright blue flowers on these plants are stunning and last well into late summer, especially if deadheaded regularly. Philotheca myoporoides ‘Profusion’ is an evergreen beauty from Australia. 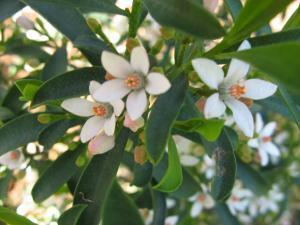 This plant prefers part shade and has lovely citrus-like blooms in the spring. 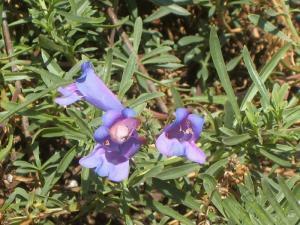 Philotheca is one of those hard to find plants that should be used more in water wise gardens. We've only had this plant in our garden for a couple of years and it is growing slowly so we haven't had to prune it. From the Mediterranean Basin, this sun-loving shrub has unique yellow ball-shaped flowers. The large wooly-gray leaves are a good texture complement to other water-wise plants, many of which have small-leaves to conserve water. Occasional water will encourage repeat blooms, however, Phlomis fruticosa will tolerate very dry conditions. You can cut this plant back by half in the fall to keep it compact. Some Master Gardeners are a little more daring and like to cut Phlomis back to six inches above the ground. This will keep the plant even more compact. Another option is to do nothing at all if the size and woodiness of the plant doesn't bother you. 'Amazing Red' is reputed to be one of the smaller Phormium cultivars; our plant has grown to about 3 feet high and wide in six years. The sharp texture and brownish-red color of the leaves makes this plant an excellent focal point in the perennial bed. We have never seen 'Amazing Red' bloom in our garden, but that's OK because Phormium flowers are not particularly attractive in our opinion. Prune out dead leaves, but don't try to reduce size Phormiums by cutting back their leaves. 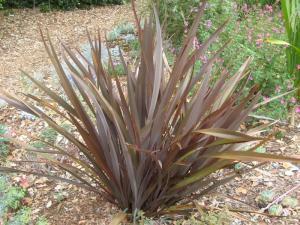 Unlike grasses, Phormium leaves won't grow back and you'll be stuck with stubby unattractive leaves. Some Phormiums revert to the brownish color of the species after several years. 'Amazing Red' has held its color in our garden for six years and for ten years in some of our Master Gardeners' personal gardens. It's always nice to find a neat, round evergreen shrub that blooms a lot and doesn't get too big. Polygala fruticosa plays nicely in the perennial garden. Its flowers look a bit like sweet peas hence the common name 'Sweet-Pea Shrub'. 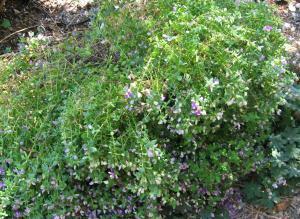 Cut back Polygala to about 10 inches above the ground in late winter to maintain its compact shape. Sunset recommends providing regular water for Polygala. We are currently trialing this plant to see if it can survive in a low water garden. Several Master Gardeners have not found Polygala fruticosa to be long-lived in their home gardens. We highly recommend western sword ferns, although we are unsure about how much water they need to look good though the entire summer. Since this is a new plant in our garden, we've been watering it every week. Now that it has been in the garden several years, we are going to put it on our once every three weeks watering regime. Western sword ferns are found in in forests throughout California and much of the west. These ferns help give shady landscapes a natural woodsy look that we like. These plants are very tolerant of competition from tree roots. 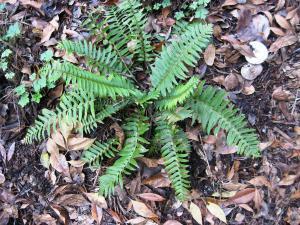 To keep these plants looking attractive, remove older fronds. These plants provide forage for elk, deer, and black bears, should you wish for any of these animals in your garden. We are always looking for small, well-behaved shrubs for the perennial garden. Pomegranates fit the bill nicely. Pomegranates flower in the early summer and have attractive golden leaf color in the late fall. The fruit, which forms in the mid-fall, adds color to the fall garden. One drawback is pomegranates lose all their leaves in the winter and don't have a particularly attractive branching structure. Sunset's Western Garden Book recommends regular water, but says pomegranates tolerate considerable drought. We have found that pomegranates do quite well with deep and infrequent watering. Another bonus of a low water regime is the tree grows more slowly and requires less frequent pruning. In our garden, we prune pomegranates in the late winter to maintain them as shrubs. Since pomegranates can grow to be quite large, some gardeners may choose to prune off the bottom branches of the shrub to give the plant a pleasing tree-like form. There are a number of ornamental cultivars that are grown for showy flowers. There are also dwarf cultivars. We do not grow these pomegranates in the Palo Alto Demonstration Garden, but encourage you to give them a try. 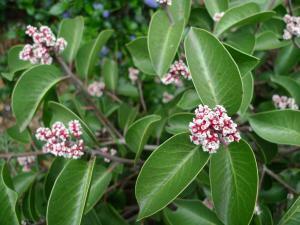 We planted the California native coffeeberry 'Mound San Bruno' in our native plant bed that receives both sun and shade. The amount of sun the bed gets varies depending on the time of year and time of day. That's a common condition in many gardens and not all shrubs do well in both sun and shade. Coffeeberry isn't a flashy shrub, but it does add much needed structure to the native plant bed. The berries on the plant are attractive and beneficial for birds and small mammals. There are many different varieties of coffeeberry. They can be used as an informal hedge or screen or gently pruned to be a bedding or foundation shrub. 'Mound San Bruno' is one of our favorites because of its compact growing habit, which works well in a perennial bed. We watered our coffeeberry once a week to get it started, but now that it is established, we water it once or twice over the summer to wash the dust off the leaves. Rhodanthemum hosmariense has lovely silver foliage and white daisy flowers. This plant makes a wonderful edging plant. 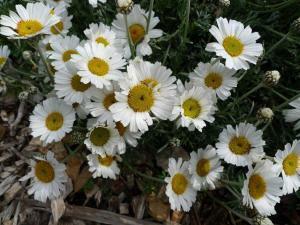 We also like Moroccan daisy because it flowers profusely in the winter when not much is in bloom. Don't over-water this plant or it will rot. It can survive on very little water. The only maintenance we do to this plant is occasional deadheading of spent flowers. The California native, Rhus ovata, is very adaptable in the garden. This evergreen shrub can be pruned up by removing the bottom branches to create a small tree. It can also be formed into a hedge or left to grow naturally as a large, rounded shrub. Rhus ovata takes sun or partial shade and tolerates occasional water in the summer. This plant is more of a garden workhouse rather than a star, but a garden full of stars would be overwhelming. These are good background shrubs for places that get no irrigation. The flower bracts, which appears in the fall, are red and show up well against the shiny green leaves. The flowers appear several months later and are small and white. 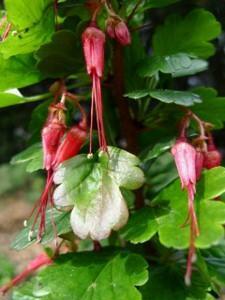 Ribes sanguineum is a useful landscape plant because it is a rare shrub that shines in dry shade. Pink flowering currant is one of the first plants to awaken in the spring with a beautiful display of pendulous pink flowers and green maple-like lobed leaves. Ribes, a deciduous shrub, loses all its leaves in the late fall. This large shrub can be used as a focal plant in the garden surrounded by smaller perennials or as an understory plant when combined with large, low-water using trees such as our California oaks. 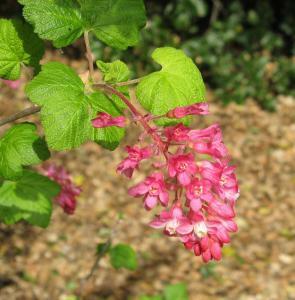 There are many different cultivars of Ribes available with flowers ranging from red to pink to yellow to white. 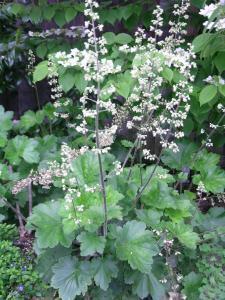 Some types of Ribes work well in full sun. Pink flowering current can get by with very little water but looks fuller when a moderate amount of water is applied in the summer. When using a currant under a California oak avoid summer water. Hummingbirds are attracted to the flowers, especially since they bloom when not much else is flowering. In the fall the shrub has blue-black berries that attract fruit-eating birds including mockingbirds and cedar waxwings. Ribes sanguineum is found along the Pacific coast from California to British Columbia, Canada. This California native is a large, spiny shrub that can exist with no summer irrigation. In our experience, Ribes speciosum will go fully dormant during the summer, therefore it's not recommended as a summer focal plant. As soon as the winter rains begin, the plant will unfold glossy green leaves and fuchsia-like red flowers that bloom all winter. The flowers that hang along the undersides of the long arching branches are loved by hummingbirds. Because of the spiny branches this shrub should be kept away from walks. It does makes a formidable barrier. Roses have a reputation for being lovely shrubs that require a great deal of maintenance and water. 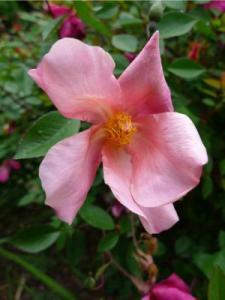 'Happenstance' rose is a beautiful, disease-free shrub rose that is doing fine on our low water diet. The pale yellow flowers of 'Happenstance' provide a calming contrast to the more brightly colored flowers in our water wise border. The arching branches of 'Happenstance' rose form a neat mound. This rose is a slow grower in our garden and doesn't need a lot of deadheading or pruning because we don't provide much water or fertilize. In February, we prune back some of the longer canes of 'Happenstance' to about two feet to keep the rose a three foot mounding shrub over the summer. Despite our low maintenance approach, this rose blooms continually in the spring, summer and fall. It's amazing! If you want to add a medium-sized rose to your water-wise perennial garden, we highly recommend this one. While most hybrid tea roses like regular water and fertilizer, there are many antique roses that withstand tough conditions. Rosa x ordorata 'Mutabilis' is very successful under our low water/no fertilizer regime. This rose likes full sun, but will grow and bloom in part shade. Rosa 'Mutabilis' grows into a large shrub with delicate blossoms that open orange then turn pink and finally maroon as it ages. The bronzy colored new foliage is also attractive. Blooming all summer, it is a focal point in our garden. We pruned this rose back to about four feet in February, selectively cutting smaller branches back to a main stem. This helps keep the plant a manageable size and encourages lots of blooms over the summer. Rosemary is one of the toughest shrubs in the garden and a great evergreen plant to anchor a summer dry bed. It is from the Mediterranean Basin and is well suited to our climate. There are many different varieties and forms, some tall, others spreading. Flower color can also vary from pale blue to deep blue, and less commonly, pink and white. The variety in the Palo Alto Demonstration garden is 'Tuscan Blue'. 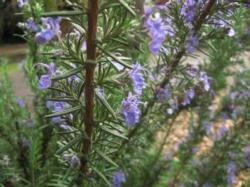 Rosemary starts blooming in the winter and provides food for bees when little else is blooming. 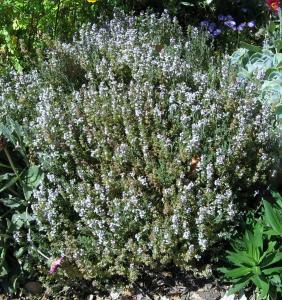 Rosemary sometimes has a small bloom in the late summer and fall as well. The 'Tuscan Blue' rosemary shrubs in our Palo Alto Demonstration Garden have never grown taller than 4 feet and are more ball shaped than vertical. Part of this may be due to less watering and part of this may be due to our pruning regime. We prune it by 1/3 to 1/2 after it finishes blooming in late spring to control its height. We also prune side branches that fall on other plants. Once the plants become mature, we prune out up to 1/3 of the large woody branches to control plant size and maintain vigor. To minimize pruning, we have taken out several of our 'Tuscan Blue' rosemary shrubs and replaced them with the smaller cultivar 'Mozart', a UC Davis Arboretum "All-Star". We'll let you know how are experiment works. Rosemary is useful herb in the kitchen. 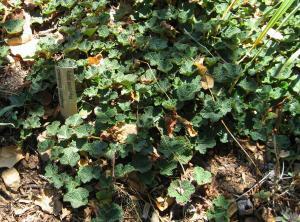 Rubus pentalobus is a tough, low maintenance ground cover that does well in dry shade -- a rare combination. We also like that the dense, spiny branches discourage weeds. The tiny fruit of Rubus pentalobus is edible, although you'll probably only get enough to sprinkle on a bowl of cereal. Salvia chamaedryoids is one tough cookie. This plant needs very little water and blooms like crazy in the late summer. We grow this plant as much for its pretty silver leaves as its bright blue flowers. Deadheading will encourage those lovely blue flowers to come back in the fall. Shearing back to the ground in late fall rejuvenates the plant. 'Winnifred Gilman' is a Salvia cultivar that is compact and has lovely violet-blue flowers. It is one of our favorite late spring California natives because the grey-green foliage smells like a chaparral morning. Like many sages, these are short-lived plants. Even with regular pruning, Salvia clevelandii needs to be replaced every five to ten years when the stems become woody. We like to prune 'Winnifred Gilman' back by about a third in the late summer and early fall to prolong the life of the plant and maintain a nice shape. 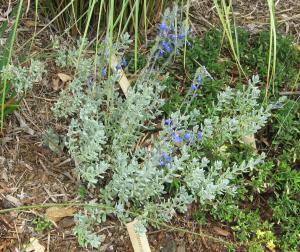 We previously had a Salvia clevelandii 'Whirly Blue' in the water-wise garden. It was beautiful, but grew too large for our compact perennial garden. We removed it and replaced it with 'Winnifred Gilman'. If you want to learn more about Salvias, we suggest reading Betsy Clebsch's The New Book of Salvias. 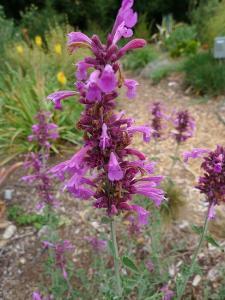 We are big fans of Salvias microphyllas in the water wise garden. These shrubby perennials come in a wide variety of colors and will bloom many months with deadheading. Salvia microphyllas also stay a nice size in the garden and will not overwhelm neighboring plants. 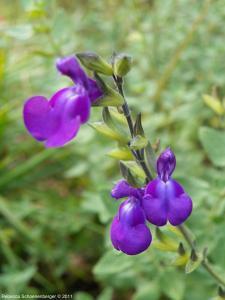 The flower pictured here is Salvia hybrid 'Cristine Yeo'. It is a cross between Salvia microphylla and Salvia chamaedryoides. This plant has only been in the garden for two years, but it is doing well enough to add to our favorites list. Salvia microphyllas prefer full sun, but this plant is doing well with morning sun and afternoon shade. It seems a little floppy, but we are not sure whether that is a shade issue or just its natural form. 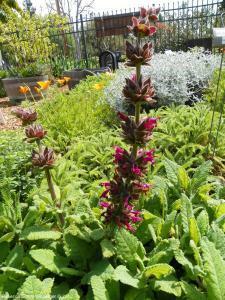 With a little work you can keep Salvia microphyllas in top form in your garden. We shear off all the flowers in early summer and again in our fall clean up. This keeps the plant more compact and encourages repeat blooming. In the spring we prune out one third of the oldest stems to keep the plant from getting woody. A nice bonus for your pruning work -- the leaves of these Salvias smell wonderful. 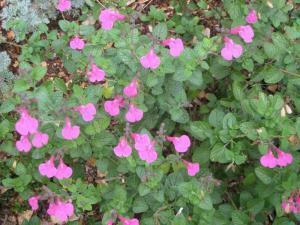 This hot pink Salvia is pretty especially in late fall when fewer plants are blooming. Salvia 'UCB Pink' seems to bloom more consistently than many of the Salvia microphylla types. Salvia "UCB Pink' is available from specialty nurseries, several of which are listed in our references. In the fall, we shear off the skinny branches of this plant to form a neat ball. We suggest avoiding cutting into the thicker woody stems because you may not get regrowth. Regular pruning keeps this plant fuller and encourages more flowering the next season. In general Saliva microphylla plants are very well-mannered in summer-dry perennial gardens and don't need a great deal of maintenance. If you want to learn more about Salvias, we suggest reading Betsy Clebsch's book called The New Book of Salvias. 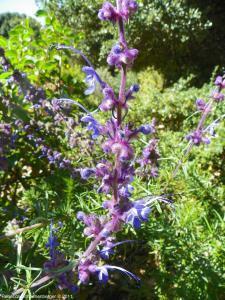 Salvia spathacea is a California native plant with an unusually (for California natives) lush appearance. The leaves of this plant are large and can grow up to a foot in length. The plant spreads by underground rhizomes and can eventually cover a large area. 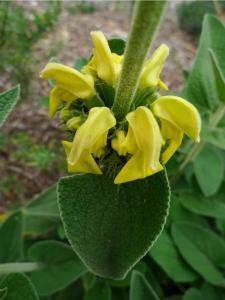 Hummingbird sage can make a colorful ground cover in dry, shady conditions. From spring until fall flowering stems appear above the foliage. The flower clusters are spaced evenly along the stems creating a bold vertical accent. Light pruning after blooming will help keep this plant neat. In the Water Wise Garden, we found that too much summer sun burned the leaves and made the plant unattractive. Also, we found that our hummingbird sage spread more aggressively than we had anticipated. A few runners were replanted to shadier spots under oak trees and we will be monitoring them carefully. 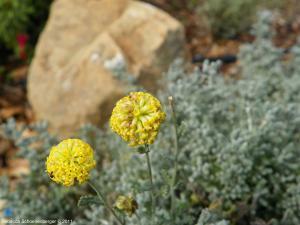 Santolina chamaecyparissus 'Nana' is a compact shrub with silver grey foliage and bright yellow flowers. We found this dwarf cultivar at Sierra Azul Nursery several years ago. This cultivar is very slow growing and stays a nice size. We originally had a full sized Santolina, but the plant fell apart when it bloomed. It looked like a mess, so we removed it from the garden. Santolina chamaecyparissus 'Nana' is a good choice for an edger or in a knot garden because it doesn't require the pruning that the larger species needs. We've used short silver plants as edgers throughout the Demonstration Garden as a way to tie the garden together visually. 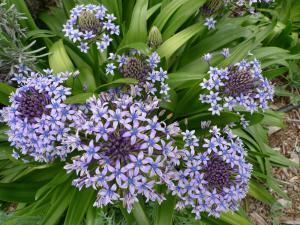 This bulb with its dome shaped cluster of blue flowers is a real show stopper when it blooms in the spring! Scilla, which is from the Mediterranean Basin, is well suited for our climate. The flowers and strappy foliage will disappear in the summer's heat. The leaves will reappear with winter rains. Going dormant in the summer is an adaptation many plants from summer-dry climates use to survive. Although our Scilla are in beds that receive water every three weeks in the dry season, some of our gardeners have had success at home in beds that only receive winter rain water. This is a very easy plant to have in your garden. Sedum 'Autumn Joy' stands very upright with no need for extra support, needs very little water and generally is not bothered by garden insects. In late summer the plant blooms a nice strong pink and slowly fades to a rust. Good for adding color to the garden when most other plants are tired and resting. During the winter months 'Autumn Joy' dies back to the ground and returns in the early spring. 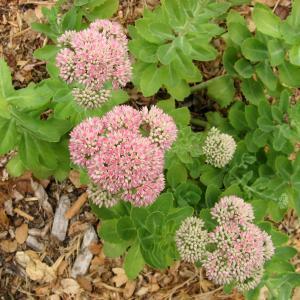 In the Water Wise Garden, Sedum 'Autumn Joy' is planted in a very rocky, well drained spot. It has grown very slowly, but steadily. It is a favorite of many gardeners because of the long lasting fall color. 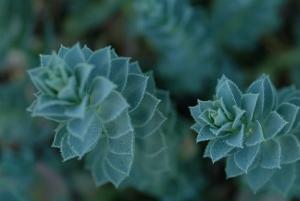 This California native plant has green or bluish green strappy leaves. In early spring small blue flowers cover the plant. 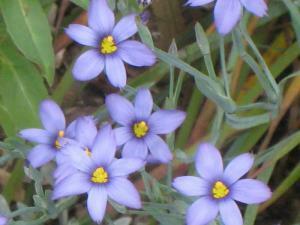 In the Water Wise Garden Sisyrinchium bellum dies back when the weather gets hot, then we remove the dried foliage. With additional water throughout the summer, plants will stay evergreen and continue to occasionally rebloom. Some reseeding will occur, but not aggressively. They are showiest when planted in masses. People love these little flowers, the clear blue is eye-catching in the spring garden. There are different cultivars that offer subtle variations. 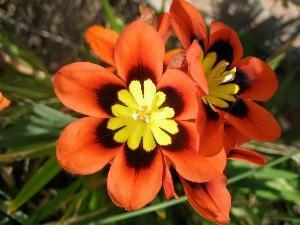 Sparaxis are another South African bulb that deserve to be more widely planted in Mediterranean climates. Sparaxis have cheerful flowers and sword-shaped leaves. They come in an assortment of colors and look pretty spectacular in a mixed planting. Best of all, they don't need summer water, but will tolerate water if you irrigate. Sparaxis is truly an easy plant that has few insect or disease problems and will naturalize without effort. The plants readily self sow. If you leave the leaves until the seed pods open, you'll have even more plants the next year. In fact, we sometimes need to pull some of the seedlings to keep them under control. These plants go dormant after blooming. We wait until the leaves have lost most of their green color before snipping them off a couple inches of above ground. Other master gardeners wait for the leaves to go completely brown and then they simply pull off the dead leaves. It isn't necessary to do this, but we think getting rid of brown dormant leaves gives the summer garden a more lush look. Unfortunately, snails and slugs love these plants as much as we do. The leaves will generally show it unless you are good at keeping snails under control. Ok, not every plant in the garden has that "wow factor" going for it and that's a good thing. You need plants to fill in bare spots and give the eye a rest. Lamb's ears is a classic filler plant for a water-wise garden. We have used it and other silver-leaved plants to visually tie together the edges of our beds. "Helen von Stein' is a wonderful cultivar because it has extra-large leaves and doesn't bloom a lot. We are always looking for summer- dry plants with large leaves to provide contrast to other plants in our garden, many of which have small leaves. Some people love the dramatic flower spikes on lamb's ears. We have mixed feelings about the flowers. Sometimes we cut them off and sometimes we leave them in place. After a couple years, these plants tend to spread and die out in the middle. Just get out your sharp shovel and divide the clumps in fall or early winter and they will be cute again by spring. Lamb's ears may also have some die back over the winter; we recommend leaving the ugly leaves in place until all danger of frost has passed. When fall and winter comes, shrubs with berries and fruit add interest to the garden. 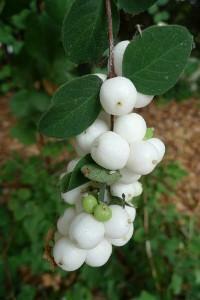 Snowberry, a California native, has wonderful white berries that show up in the fall and last through winter. These berries are attractive to birds too. One of the best features of snowberry is it actually likes dry woodland conditions. It is a rare shrub that will thrive under a thicket of oak trees. At the Palo Alto Demonstration Garden we have it growing in a shady area that gets no summer irrigation. Some people find the branching structure of snowberry to be messy. We have not tried this yet, but California Native Plants for the Garden recommends occasional coppicing to improve its appearance. Coppicing means to cut back a plant to about one foot from the ground. This usually works best right before a plant puts out new growth in the spring. 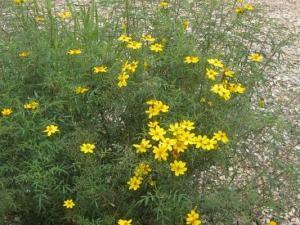 Tagetes lemmonii is a sprawling shrub-like perennial with cheerful yellow flowers and aromatic leaves. The plant is originally from Mexico and the southwestern U.S.
Mexican bush marigold can become large and ungainly, so we recommend shearing this plant several inches from the ground in the spring to keep the plant compact and give it a nice shape. Also you should prune out any frost damage once the danger of frost is over. Tagetes lemmonii is not long-lived in the garden, but if you like yellow flowers and enjoy the smell of its leaves this plant is worth planting. In the water wise garden in Palo Alto, we removed Tagetes lemmonii because it repeatedly suffered frost damage and was not attractive. Tanacetum densum amani is an interesting ground cover that is native to Turkey. 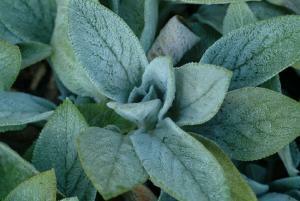 Its leaves are silver and have a feathery texture that people are drawn to. We have used this plant as an edger in one of our beds. One drawback to the plant is the small yellow flowers that appear in late spring. Some people like them, but we cut them off. This plant has survived, but not thrived at in the Palo Alto Demonstration Garden. One of the reasons may be it likes more water than it receives in the demonstration garden. We water deeply every three weeks. We suspect this plant would look lusher in the summer with deep weekly watering. This plant is not easy to find in nurseries and gardens. If you like the texture, Tanacetum densum amani is worth seeking out. Teucium fruticans 'Azureum' has to die for blue flowers all winter long. The rest of the year it has a smaller floral display. The deep blue really stands out against the grey foliage. The species (original unnamed plant) is dull in comparison. The only draw back to bush germander is it can get really big. In June of 2010 we pruned our bush germander back to 4 inches to help control its size. The shrub came roaring back with a natural shape and a slightly smaller size. The winter blooms are a plentiful and as lovely as in previous years. We recently planted a smaller Teucrium cultivar, 'Compactum' that is reputed to stay 3 feet tall and wide and have intense blue flowers. We will report back on its behavior in a couple years. Many herbs, including thyme, are great additions to water wise gardens. You can use them in cooking, they smell great and their foliage and flowers are attractive. Thyme makes a nice ground cover for small spaces. 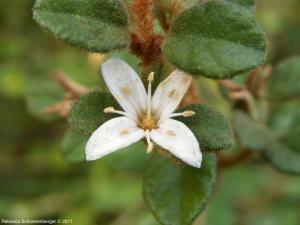 It has grey-green leaves and small white flowers. We have repeated grey-green plants in the edges our borders to tie together the look of our beds. To keep thyme neat, we shear back the faded flowers in early spring. Many thymes are not long lived, but Thymus vulgaris has proven to be long-lived in our water wise garden. We approached growing the California native woolly blue curls with some trepidation because it has a reputation for being difficult. It is sensitive to overwatering and poor draining soil and often is short lived. But it has beautiful flowers! The foliage smells like bubble gum when rubbed, which is also a neat feature of this plant year round. 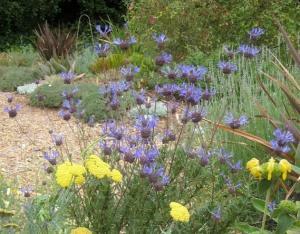 Several years ago we added a woolly blue curls to our California native plant bed. The plant was mulched with rock to improve drainage and received no additional summer water. Our woolly blue curls has bloomed and grown over the years, but it really wants a sunnier spot. The plant is reaching out for more light and has woody, unattractive stems. We’ve avoided cutting the plant back hard, because we have read it does not get new growth on old wood. Some sources suggest planting woolly blue curls as an annual; if you love the flowers that might be an option for you. In all honesty, if your heart is not set on a California native, there are probably easier low water plants with lavender flowers. 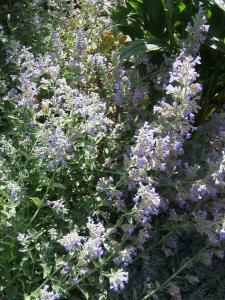 Lavender and Mexican sage are two lavender flowered plants we think are safer choices for the novice gardener. Triteleia ‘Queen Fabiola’ is a California native bulb with very pretty purple blue flowers in the late spring and early summer. It has grass like leaves that go dormant in the summer. In the Palo Alto Demonstration Garden we have planted 'Queen Fabiola' in several beds on edge of the garden that receive limited or no supplemental water. We have found that because 'Queen Fabiola' has delicate flowers and blooms in the late spring when lots is going on in the garden, this bulb needs to be massed to make an impact. Avoid summer water especially in clay soil. We remove the brown leaves in the summer to keep a tidy look, but that's not necessary. 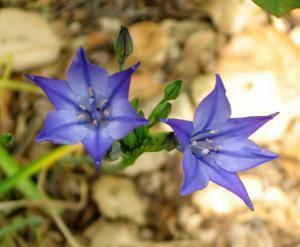 Triteleia 'Queen Fabiola' used to be called Brodiaea and many bulb catalogs still list it under that name. This is a fast growing plant, which if happy in the garden, will spread by seed. It has a small clump of green leaves that produce tall flowering stems in the hot summer months. The overall look is light and airy. Tall stems should be cut down when flowers have faded. Best used as a background plant. 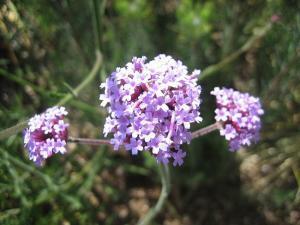 Verbena bonariensis does best in hot, dry locations with good air circulation and well draining soil. This plant is no longer in the Water Wise Garden. When we grew it, it needed some supplemental water to keep it thriving. Watsonia is another South African plant that grows well in our area. The pink gladiolus-like flowers are a highlight of our late spring garden. The sword-shaped leaves provide strong accent points in our beds. This is a summer dormant plant, which means it can get by on almost no water in the summer (good), but has unattractive leaves starting in July (bad). We solve the ugly leaf problem by cutting the leaves back to a couple inches above ground in mid-summer. This results in a bare spot in the bed. If that bothers you, install a plant next to the Watsonia that will fill in the bare spot during the summer and fall months. Some retail nurseries carry a selection of Watsonia corms (bulbs) in the fall. 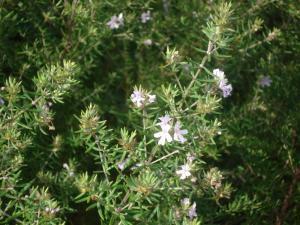 This shrub from Australia looks a lot like rosemary, but its leaves are finer and have no fragrance. It has pretty light lavender flowers that appear in midwinter and last through spring. Westringia gets big so plan ahead unless you want to be doing a lot of pruning. Unlike rosemary, the stems of Westringia do not get woody, which makes it is a better long term landscaping choice. Unfortunately we had to remove this plant from the garden to make way for a city of Palo Alto well project.